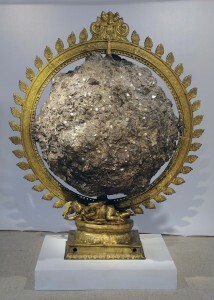 Tallur L.N., “Unicode,” bronze, coins and concrete, 2011. Courtesy of the artist and Jack Shainman Gallery, New York. India and the World: A History in Nine Stories is a unique exhibition presented as a collaboration between Chhatrapati Shivaji Maharaj Vastu Sangrahalaya (CSMVS), Mumbai, The British Museum, London and the National Museum, Delhi. Lead support for the exhibition is provided by the Getty Foundation & Tata Trusts. Additional support is provided by the Newton Bhabha Fund and Ministry of Culture, Government of India. This exhibition will showcase some of the most important objects and works of art from the Indian subcontinent in dialogue with iconic objects from the British Museum’s world collection. As part of the commemoration of 70 years of Indian Independence, the exhibition will bring together around 200 objects not only from the collections of these three Museums but from around 20 museums and private collections across India. The Indian objects within each section are positioned within a global context and serve to explore connections and comparisons between India and the rest of the world, covering a period of over a million years. What is the earliest evidence of human history in India and how does that compare with other parts of the world? What was happening in India when the pyramids were being built in Egypt? While emperors across the world conquered new lands why did emperor Ashoka make one of the earliest pleas for peace? How have different civilisations pictured the divine? How did rulers promote themselves through court, art and propaganda? What have been the routes of civilizational exchange over land and sea that make India a part of the world? And have those exchanges always been peaceful? How have different countries and communities articulated their quest for freedom in recent history. The section, Time Unbound talks about our relationship with time, the living world and that which lies beyond, which can be viewed from many different perspectives. LN Tallur’s sculpture draws on the cyclical view of time in Indian traditions. Here, Shiva, who dances the dance of destruction and rebirth, appears to be entombed in a ball of concrete and money.